Home » king kong , kong king of skull island , movies » KONG: KING OF SKULL ISLAND to become a real movie! 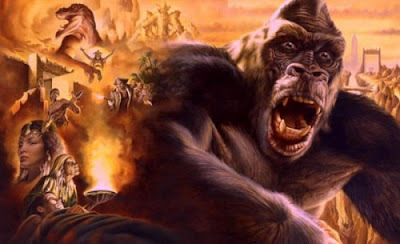 KONG: KING OF SKULL ISLAND to become a real movie! Variety is reporting today that Spirit Pictures is setting out to adapt Kong: King of Skull Island as a feature film. The plan is to use motion-capture technology like what Robert Zemeckis used to make The Polar Express and Beowulf (i.e. very life-like computer modeling and animation). Kong: King of Skull Island was a lavishly illustrated 2004 novel by Joe DeVito and Brad Strickland. It serves as a sequel to the original 1933 movie King Kong (it even received the blessing from the family of King Kong creator Merian C. Cooper) as well as being a "prequel" of sorts in that it lays out the tale of what Skull Island was like before Carl Denham and the crew of the Venture arrived. I reviewed the book way back in late 2005 and had nothing but good to say about it. In fact, I recently wound up re-reading it and was just as overwhelmed by Kong: King of Skull Island as I had been the first time. Trust me folks: if done right, this could be a seriously terrific movie. One that I would gladly pay to see several times at the theater (and even multiple times in IMAX). In the meantime, I'll be keeping an enthusiastic eye on this as it develops.